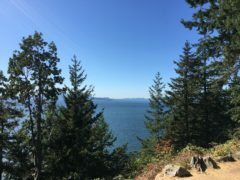 When I signed up for the WomanTour’s Pacific Coast tour, I knew that I wanted to start at the Canadian border, not just at Anacortes, where the tour begins. 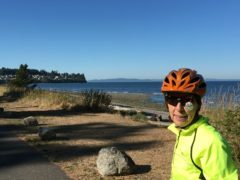 I explored routes on Ride with GPS, then contacted Lynda Churchfield from my East Coast ride who lives in Blaine, WA. 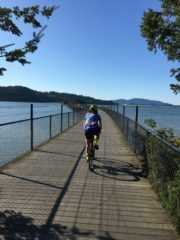 Not only did she review a suggested route, she invited Don and me to spend the night at her home, and to ride to Bellingman. 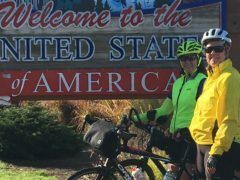 Joining us was Barbara Blackford from Atlanta, who was also on my East Coast ride. After a healthy breakfast at Lynda and Dennis’ home, Don drove us to Blaine, to retrieve Lynda’s bike from a friend’s house. 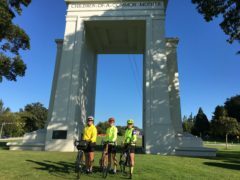 From there the three of us cycled to the Peace Arch Park, a Washington State Park. 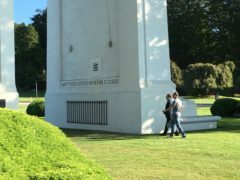 The Peace Arch Park was created more than a century ago as a “neutral” space between the USA and Canada, a show of friendship. You can walk back and forth within the Park to the Canadian side without a passport. Many more cars were traveling from Canada to the US than from the US to Canada. After many photos, it was time to get rolling. 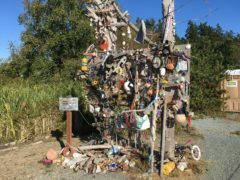 We said goodbye to Don who was to meet us in Fairhaven, south of Bellingham, in three hours. 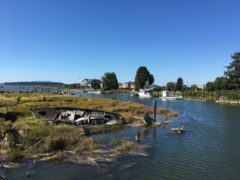 Lynda knew the most scenic and traffic-light route, first along the beach past Birch Bay near to her home, then inland in farm areas with excellent views of Mount Baker. 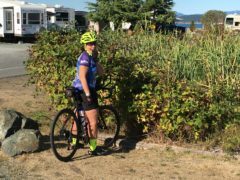 We stopped at a bike shop in Bellingham to have an adjustment to my cables as I was having some shifting problems. 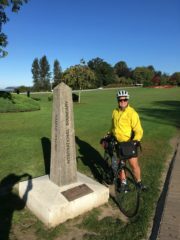 Arrived in Fairhaven close to 1 pm (departed Peace Arch at 9:30 am) and said goodbye to Lynda. Don was driving her back to her home to prepare for another houseguest. 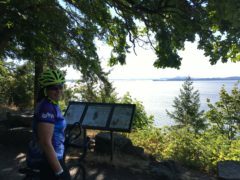 Barbara and I shared a sandwich, then “attacked” Chuckanut Drive, noted hill route. Jonathan, I am pleased to say that my new lower gears are working great!! 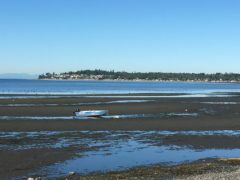 The ups and downs go on for some dozen miles, but the views are wonderful of the various bays. 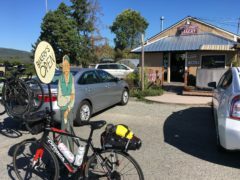 Once out of the hills, we celebrated at a bakery in Bow, before facing a likely headwind for the remaining miles into Anacortes. Luckily, our route was a zig zag that gave us some tailwind, combined with a cross wind. 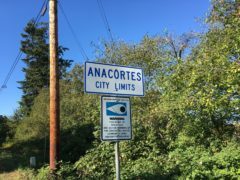 Just after we saw the sign announcing arrival in Anacortes, I took a wrong turn and led us an extra eight miles. 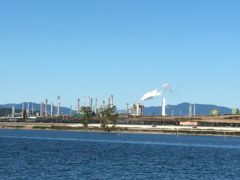 But, as a result, we got to experience long tanker wharfs (more than 3 football fields from the refinery to the waiting ship) and the Fidalgo Bay Nature Preserve rail trail into the east side of Anacortes. 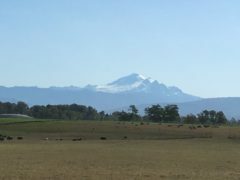 We arrived safe and sound around 5 pm to the Majestic Inn, where the WomanTours ride begins on Saturday. No walls between US and Canada! 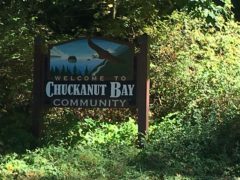 With or without the bonus 8 miles, that is quite a trek! Glad you got a resolution for the cables. Great photos of the first (unofficial) day! OMG, looks like you are off to a good start. Have a safe and happy ride. 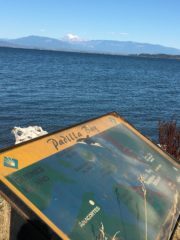 As always, i am in awe of your adventures but really enjoy them vicariously! Safe travels! Ginger B. 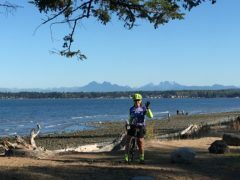 Thank you for sharing your amazing cycling adventures and pictures! We hope you have a great ride to San Diego! And you’re off. Hooray! You can’t do too much hill training for this trip!